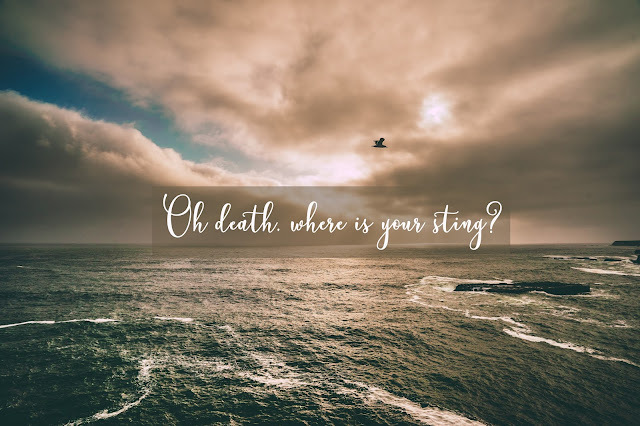 The Backyard Missionary: Oh Death, Where is your Sting? I remember that morning well. We had just barely slept for a few brief hours before we were called back to see her. We were exhausted as we walked down the hospital corridors to her room. I took a deep breath, opened the door and went in...alone. The morning sunlight danced beautifully around her room. It was quiet and soothing. I walked cautiously to the side of her bed unsure if I was ready to see her. Just two short hours before, my mom had taken her last breath. Her journey with us ended...or so it felt at the time. Death was not new to me. In fact, death had become so commonplace in my life that I surprised myself by my reaction to this particular one. She wasn’t even my first “major” death as they call it (whoever "they" are). But this one took me on a journey. Where exactly had she gone? She clearly wasn’t with me in the room anymore, only her vacant, warm shell remained. She still smelled like mom, still felt like mom I noted as I buried my face in her neck inhaling deeply. I noted the freckle on her jawline as I mentally tried to absorb every detail of her so as not to forget later. It was the same freckle I fell asleep looking at as she used to rock me when I was young. My Christian upbringing told me that she was in Heaven. I never once doubted that. Everyone kept saying, “She’s with the Lord now.” I believed that too. “She’s gone home,” said another. Yup. Got it. 1. Heaven is not a floating destination in the clouds. It is real. It is concrete. Mom’s feet were not floating around somewhere. They were walking on the very real soil of Heaven. Although I’ve never been to Australia, I know it is real and people are doing things similar to where I live. Heaven is no different, although it is most perfect and free from sin, it is still as real as the countries of earth. 2. Heaven is not so different from here that it will be unrecognizable. There are trees and flowers, instruments and music, a climate, things to do, places to live, and people (some we know and others we do not). The same Creator who made earth also made Heaven. We will recognize many of the same features. 3. Memories from earth are not erased in Heaven. Our minds don’t suddenly develop a sort of "earth amnesia" where everything we did here simply slips from our minds. We will know abundantly more than we do now, but we will not forget the people and memories. My mom was not present with us, but she had not ceased thinking about me. 4. I want to go there one day. Perhaps this was the greatest truth that began to sink in. Death lost its sting with the death of my mom. Heaven was no longer the scary unknown anymore, but a real place with people I love waiting for me. 5. The message of the empty tomb not only set me free from the fear of death, but made me long for the day when I enter into Heaven. Oh the glorious empty tomb! The reminder that Jesus set me free from the very fear that I had been packing. Death won’t stop me from my freedom! Sickness won’t stop me from my freedom! My own sinful nature has been washed cleaned and I am free! One day I will have my turn. I will take my final breath this side of Heaven and step into the arms of my Saviour eternally. My feet placed on solid soil in the perfection of Heaven, where the light of God shines so brightly the sun will no longer be needed. I am here today, that much I know. But, the promise of my eternity is deeply embedded in my soul as the Holy Spirit reminds me of what is to come. I long for that day! May you be reminded this Easter weekend, that Jesus paid the price for us to be able to enter a very real, very perfect Heaven. It is not a story of long ago and far away, it is fact pertaining to YOUR future. A future where not only Heaven will become real as you view it, but so will the embrace of God Almighty as He opens his arms and welcomes you in.